For reasons unknown, I never captured the individual steps involved in making the earlier tables. And so, I am going to take advantage of Google Sketchup and the illustrations I made to try to explain the steps in making this simple table. 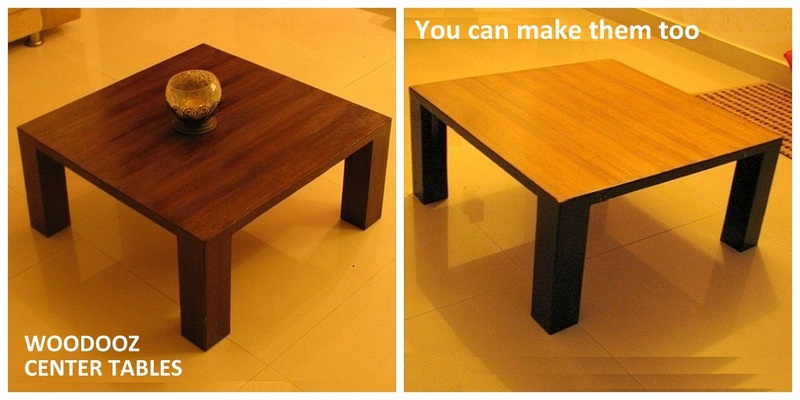 Point to note : This will work wonders if the height of the table is low, and the legs are wide. Padauk Wood (4 inch x 4 inch and 23cm in height). You can get this from either a plywood store or a local timber store. 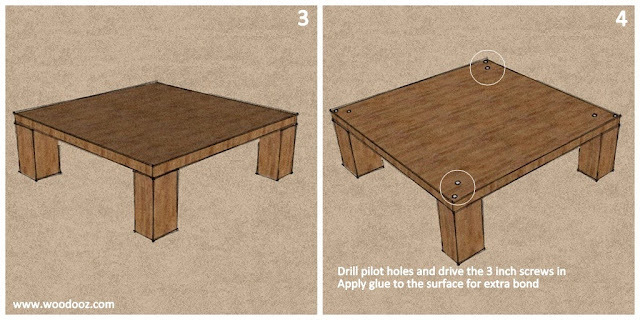 Drill pilot holes through the plywood top and into each of the legs beneath. Through the already drilled pilot holes, drive the 3 inch screws in. 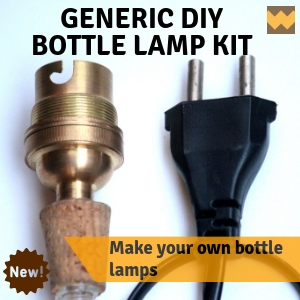 You will need a minimum of 2 screws and can add more if needed. As you can see, I drove those screws along the diagonal edges of the padauk legs. You can smear Fevicol SR (before you drive the screws) to the surface of the legs and the top where they come in contact with each other. Just allow the glue to dry and your table is ready. Of course, it is not ready in its finished state. You still have to sand, add color and apply a top coat. You can also install rubber bushes to the bottom of the legs to make pulling around noise free. 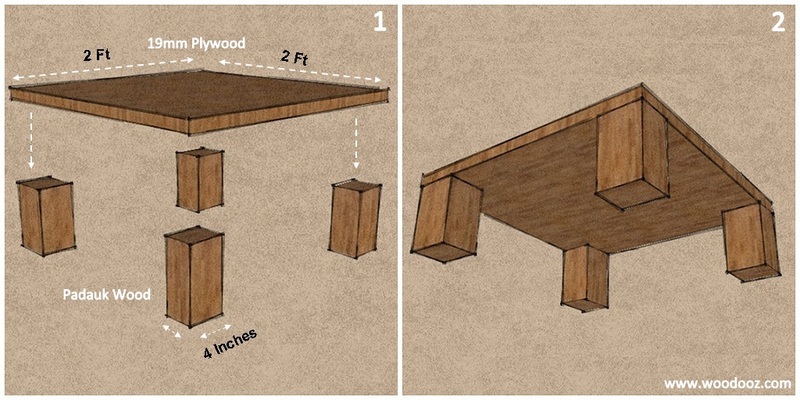 Do remember that this simple technique works as long as the table height is low and legs are wide. Longer and slender legs would mean there would be instability because of wobbling. 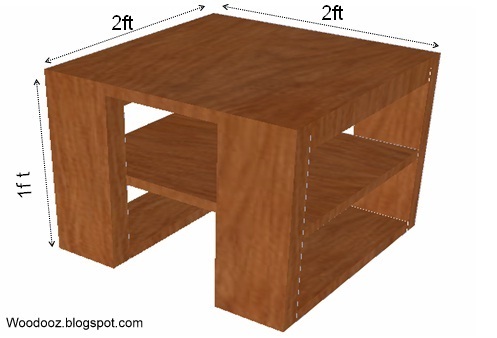 Of course, this can be overcome by using joints and additional horizontal support between the legs, but then, it would not be the easiest table to make, right? To finish, here’s what I did (You can click on the links for more details). I covered the top with One Side Teak, completely sanded all the surfaces (top and the legs) and finally stained it. So, agree or not agree? Does that look like the simplest table? Share your thoughts. As we step into the fourth year of Woodooz tomorrow, we wanted to look back at our most favorite project ever. This center table - The first thing we ever made. Still remember how when we started, we had absolutely no clue how to go about it. The internet had loads of information, the plywood store guys were not so helpful and we had no expertise whatsoever to even think that we could pull it off. It has been an enriching ride here in Woodooz with learning opportunities coming our way every other day. 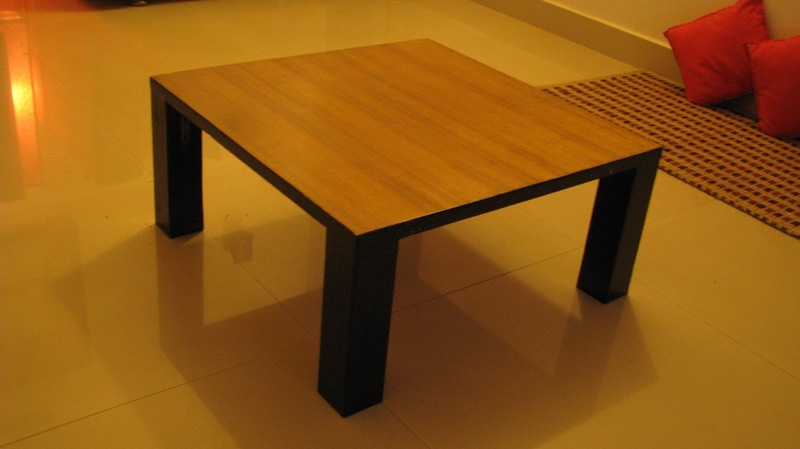 It is this table that made us ask the question, "Can we make it ourselves?" every time we wanted something for the home. Three years on, and we still proudly use this table in our living room.. It may have its minor defections, but to know that we built it from scratch has always given us immense pleasure. The table has seen many a steaming coffee spills and yet has stood the test of time. Many a dinners have happened around it. We have used it for all our Scrabble and Rummy sessions. And to think how many conversations it has started only makes this table a personal favorite of ours. This one was custom made for a colleague.We provided a 3-D view of the design we had in mind and after few mail exchanges, the design and the dimensions were finalized. While a detailed step-by-step DIY of this project with pictures is due, here is a list of learning that we had from this project. Having a design on paper helps understand the material requirements better. There was zero wastage on plywood that we bought for this project. It also helped arrive at a near accurate estimate of the cost. Check out the finalized design we made for the project. Allenkey cross dowels are pre-dominantly used in making knockdown furniture. Here's a good tutorial on how to install these dowels. 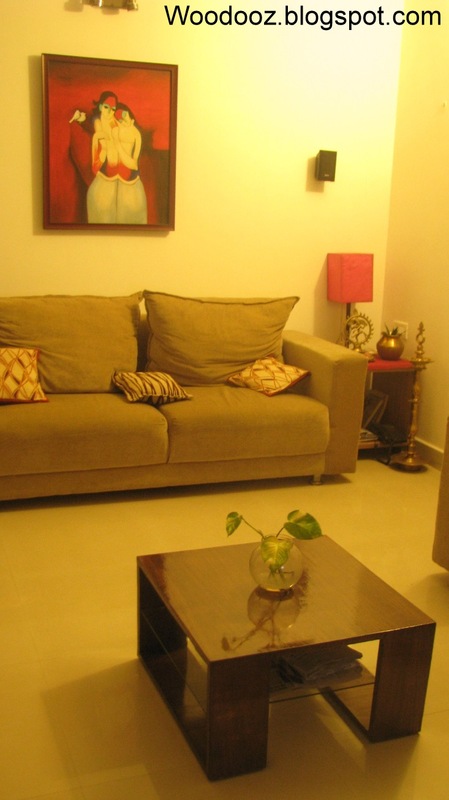 Cross dowels in Chennai are probably available only in Parrys and so we used ordinary bolt and nut as an alternative. 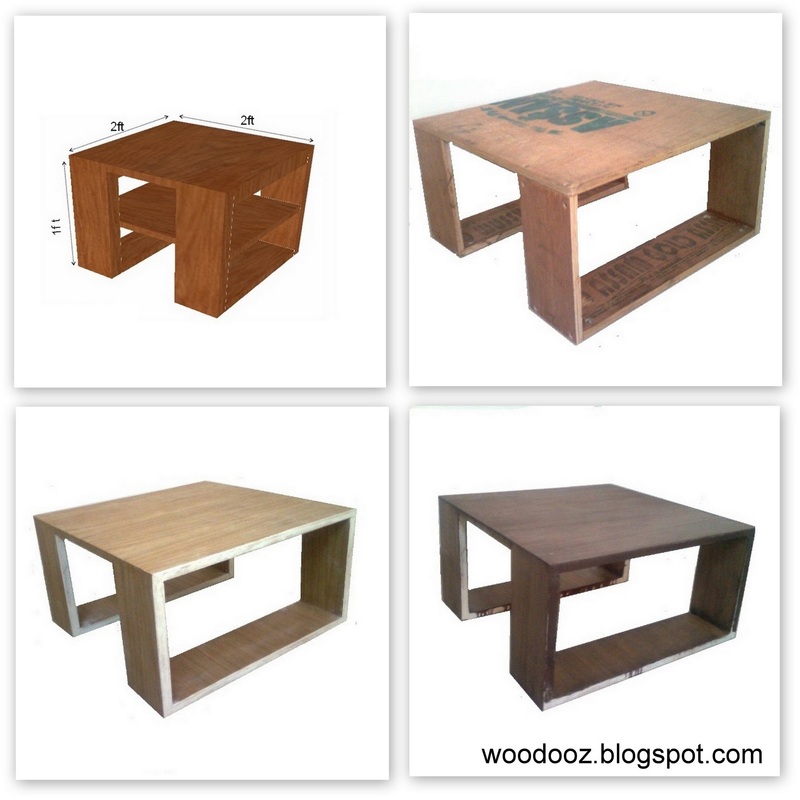 In the process, we have learnt to understand little bit on the nuances of knockdown furniture. Though leaving the grains open is more of a trend in recent times, we learnt that using paste fillers can help fill the grains resulting in a much smoother finish (Thanks to a 10 min session with a professional carpenter). We also learnt how to install a glass shelf. And that means few more projects that we wanna do using glass and we incidentally have one requirement at home. More on it later. Plywood is ideal for smaller stationary projects, but the more the use of plywood, the more it adds to the weight. We learnt that we may have to look at alternate lighter raw material for any such projects in the future. It is not always required to start with an 80 grit sand paper and work towards the denser ones. For some of the pieces, we had to start with 120 grit. 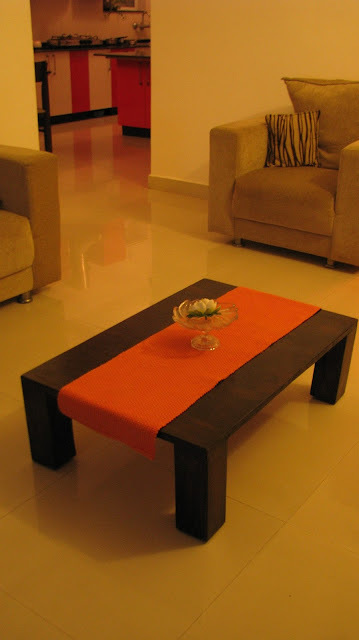 The use of sand paper is subject to the existing smoothness of the surface. Use of plywood edge banding is recommended. We learnt that applying putty and painting edges may not provide the desired finish all the time. We also learnt, if one is losing 99 strands of hair per day, it is better to wear a cap especially during the process of varnishing. It is better to understand the workload involved besides knowing the amount of time one can spend on such projects outside of their day jobs. It helps better to set the right expectations in terms of timelines. We are still novices and still battling with estimating the right workload, but we have learnt that we need to factor unplanned weekend activities (family trips, functions, work etc...) before committing timelines. Do let us know what you think. Any feedback / comment is welcome. Do you think there is something amiss ? Share your thoughts. When custom making furniture, the end user may want to have an idea of the product through a 3-dimensional image (Check out our 3D gallery of furniture). Besides serving this purpose, a 3D image is also useful to estimate raw material requirement, identify areas for additional reinforcements, play around with colors, and most importantly to arrive at a near accurate cost estimation. Having a 360 degree view helps plan for every possible requirement in advance as against learning and applying during the making process. 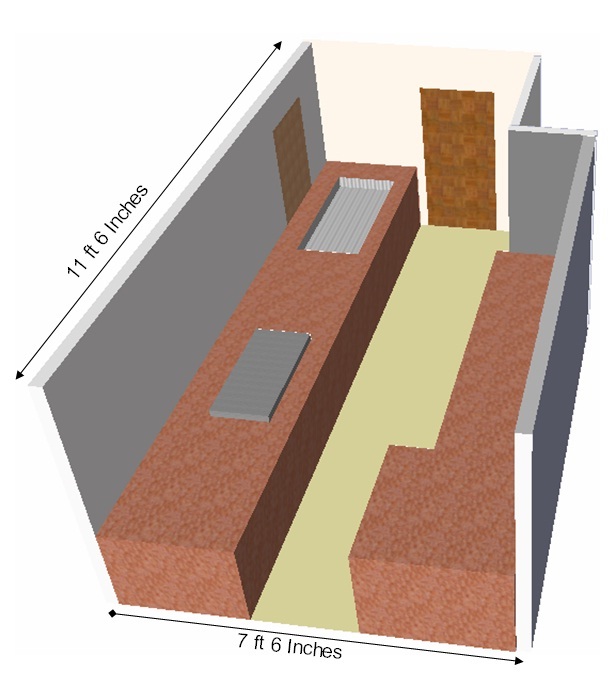 Creating a 3D image is easy if your basics on geometry, elevation, projection and perspective are intact. 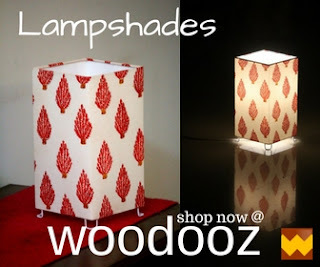 It is addictive and you can see yourself creating more designs - copied, inspired, original or otherwise. 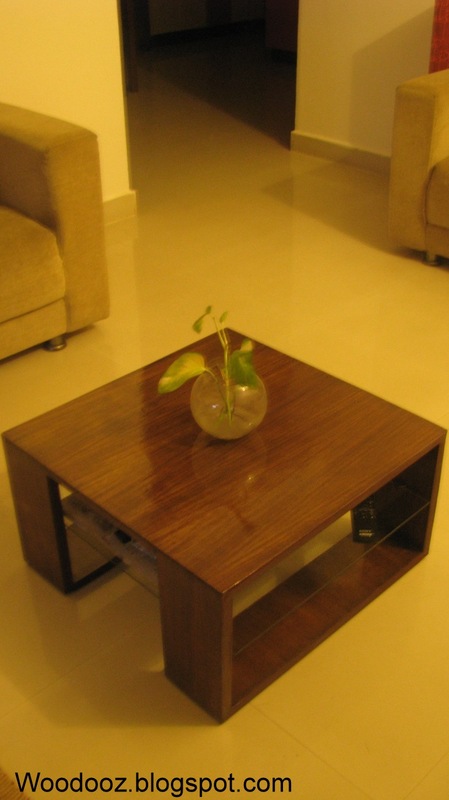 This coffee table was inspired by many similar designs and has been approved by the potential user. It is now work in progress and likely to be completed in another week. For this project, I used Google Sketchup. 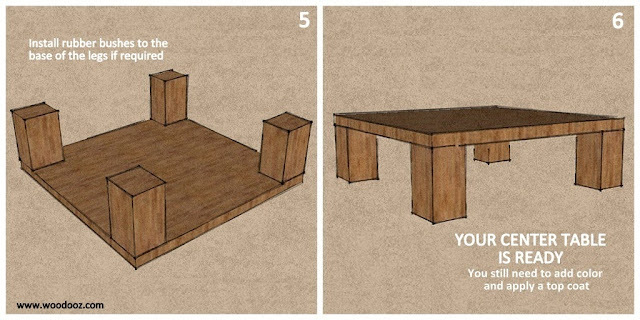 Sketchup is a freely available Google tool that allows for creation of 3D models of furniture, rooms, and other design models. 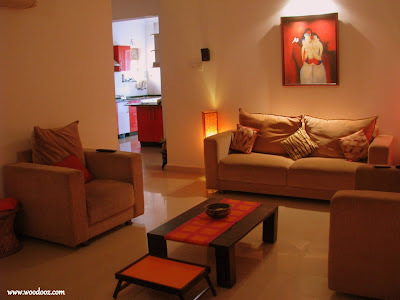 It is used by designers to play around with their designs and comes with a user friendly interface. I created this 3D model of our kitchen for the SMALL KITCHEN COMPETITION @ APARTMENT THERAPY. Considering I have very limited background on design, you can imagine how much of an easy to use tool it is. Over to you : Do you plan your designs prior to implementing them ? 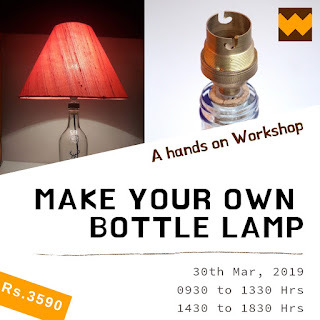 Be it decorating your room, or building a piece of furniture, do you visualize what you want and how you want through an interface besides your mind ? What tools do you use ? Or do you love the traditional way of capturing your visuals in a paper ? Share your thoughts. 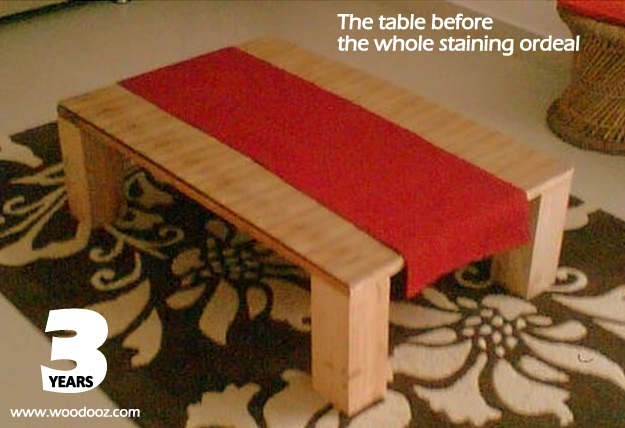 The art of staining, mastered (almost) finally… Maybe it requires a separate post by itself. As for the center table, we wanted to make one that is sale worthy. We stuck to simple design as in the previous cases. 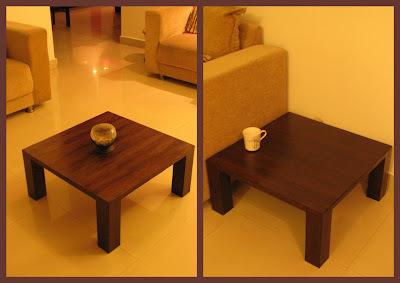 However unlike the earlier tables (Square Center Table and Low Center Table), where stain was applied directly over the legs and the plywood sides, we decided to layer the entire table (legs, sides and the top) with 4mm sheet of teak (One Side Teak). The stain was applied over this sheet. We also did not use sealers. This reduced, though didn’t completely eliminate, the amount of time spent on sanding the wooden surface, as OSTs come with a relatively smoother finish. Nonetheless, the saved up time was spent on cutting the OST and sticking it on the wood surface. After the multiple layers of walnut stain were allowed to dry, the table was coated with clear varnish. Quite an improvement, and personally we are happy with the outcome. When we decided to make another center table DIY, it wasn’t for our own use. We thought it was perfect gift for a house warming ceremony. This time around we applied all our learning from the earlier making of our own center table to come out with an almost perfect table. we used Padauk wood for the legs this time. We additionally used chalk powder and paste filler to attain the smooth finish for the plywood sides, which was missing in the earlier center table (the multiple layers of plywood was visible). We decided on a smaller table (2 feet by 2 feet) to suit the living room dimensions. Also, we went for the dual color finish to retain the natural look of the OST layer. We also additionally used a painter's masking tape to be able to get sharp paint lines between the top surface and the adjoining edges. The tape also help in preventing bleeding of varnish, which in most cases is difficult to remove once dried.